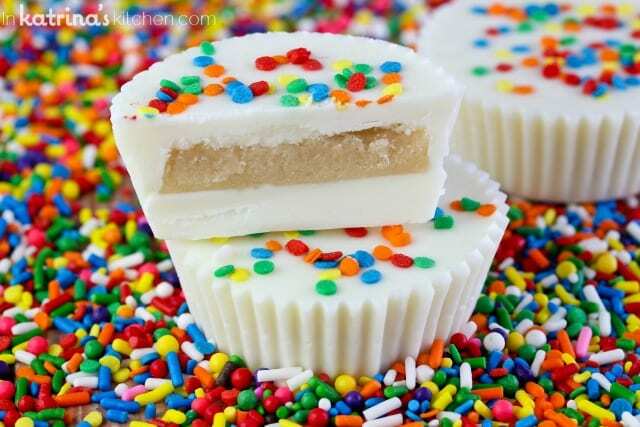 Sugar Cookie Dough Cups are like a peanut butter cup only better! Customize these candy cookie cups with sprinkles to match any holiday or party theme. 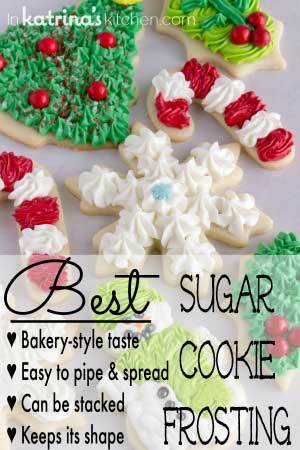 Anybody else out there crazy for sugar cookies? I like sugar cookies so much that I’ve spent the last 20 years perfecting my sugar cookie recipe. Talk about chocolate all you want but vanilla is where it’s at for me. So when I opened up my copy of Dessert Mash-Ups by Dorothy Kern (Crazy for Crust blog) this recipe jumped out from the pages into my dreams! These Sugar Cookie Dough Cups are so heavenly that I needed to get them out of my house ASAP for fear that I would consume all 12 of them before my children came home from school. Cookie dough…vanilla…SPRINKLES! 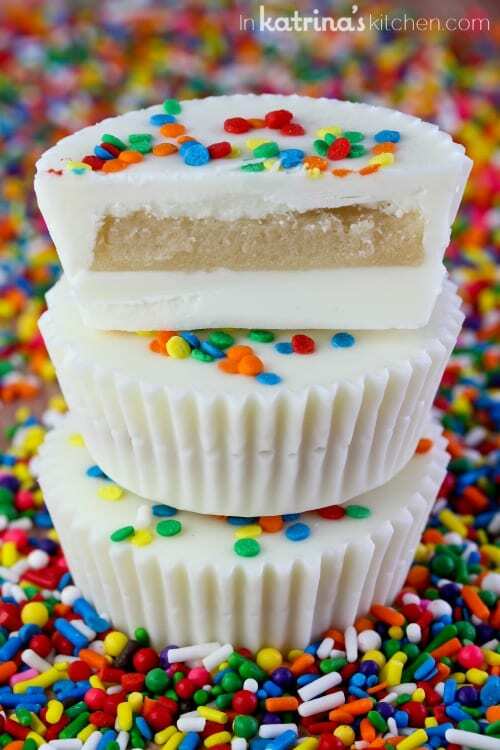 Not only are these little candy cups perfectly portioned, they are great for any occasion. Just change up the sprinkles to make them festive. Right now I’m obsessed with these jumbo nonpareils. Judge all you want but I’m allowed to be obsessed with sprinkles. And sugar cookie dough. I just finished Christmas shopping for my niece so of course I had Frozen on the brain. 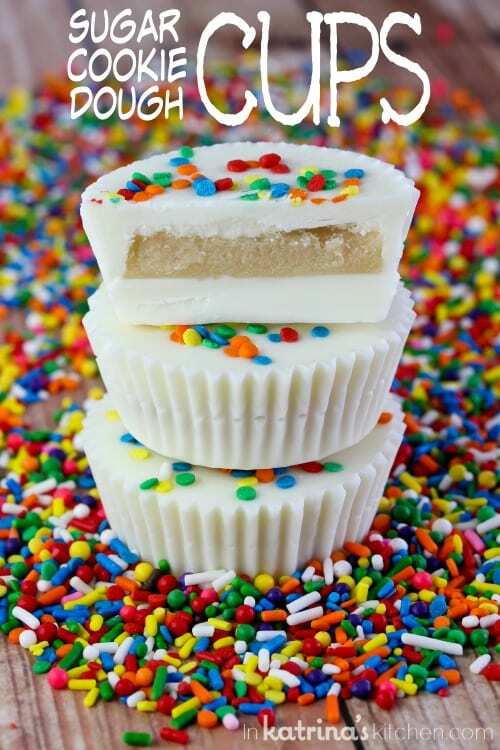 I would suggest making these candies with a mini muffin tin instead of a standard if you are making them for a party. You’ll have more to keep up with the demand! I don’t know what else I have to say to convince you to try this recipe. 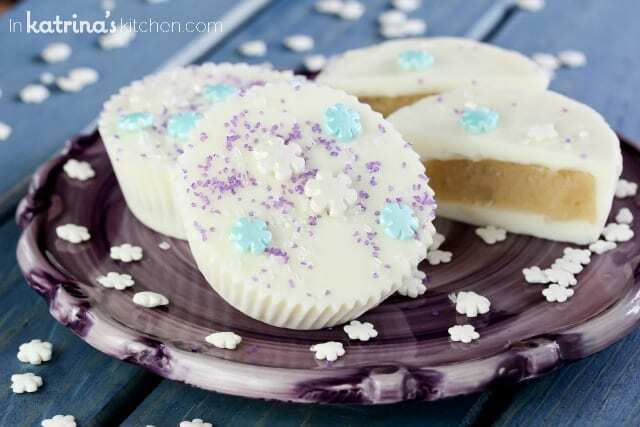 It’s like a peanut butter cup but filled with eggless, safe-to-eat sugar cookie dough. Or you could purchase Dorothy’s book and make yourself Death by Chocolate Brownie Layer Cake, Milky Way Pie, S’morescake, or Lemon Meringue Pie Fudge. Basically I’m telling you to get your fat pants and Netflix and go to town. You’re welcome. In the bowl of a stand mixer fitted with the paddle attachment or with a hand mixer in a large bowl, cream together the butter and sugar. Beat in the vanilla, milk, and flour. Form the dough into a disk. Place between two sheets of waxed paper on a cutting board. Roll out to 1⁄4 inch thick. I like to peel the waxed paper off the top, then flip the dough over and peel it off the bottom after every few rolls so that it doesn’t stick. Refrigerate for at least 15 minutes. 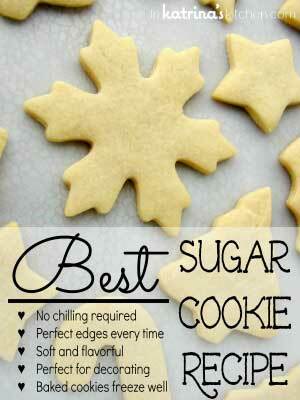 Using a 2-inch round cookie cutter, cut 24 circles of dough, rerolling as necessary. Place half the dough rounds on top of the other half, for a total of 12. Refrigerate until ready to assemble cups. Melt the melting chocolate according to the package directions. Line a standard 12-cup muffin pan with paper liners. Spoon about 1 tablespoon of melting chocolate into the bottom of each liner, enough to coat the bottom. Tap the pan to settle the candy and release any air bubbles. These are a big dose of sweet! To make them more bite-size, use a mini muffin pan, with mini muffin liners and a 1-inch round cookie cutter. 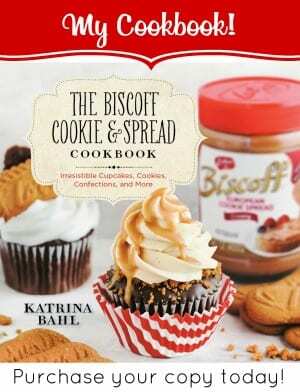 You can also make these with your favorite flavor of cookie dough. Just substitute 1 tablespoon of milk for each egg called for in the recipe to make an eggless cookie dough, and you can omit any leavening that is called for. 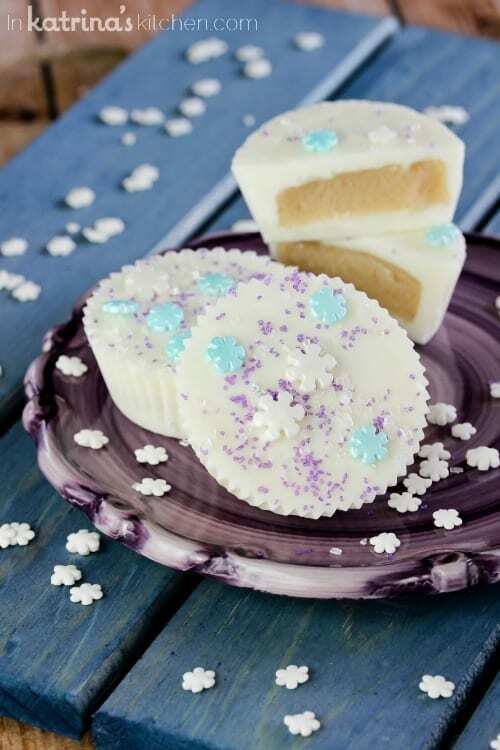 Use vanilla or chocolate candy melts,depending on your cookie dough flavor. I did cheat on the instructions a bit. I rolled out my dough into a large, round disc and refrigerated it before cutting it into circles. Whenever I have to put something round into a muffin tin I use a champagne fluted glass to cut the circles- it makes the most perfect portions! 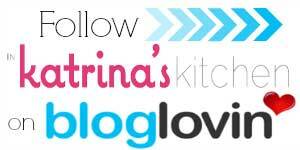 Hi Katrina. 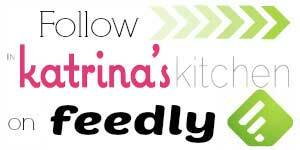 I was wondering if you could help me with this recipe. We are a big chocolate chip cookie dough fans, and I was wondering if you could tell me how I would go about using this instead of the sugar cookie dough. I’m a little confused as to the recipe and how to incorporate other ingredients. OH Boy! These look crazy yum! These are adorable and would make perfect gifts! Oh my word, these are so fun!!! these are a dream come true!! my girls will flip when I make these!! These cookie cups are bookmark in my copy of Dorothy’s book. My girls want to make them so bad! 🙂 Love your sprinkle variations! These are so FUN! 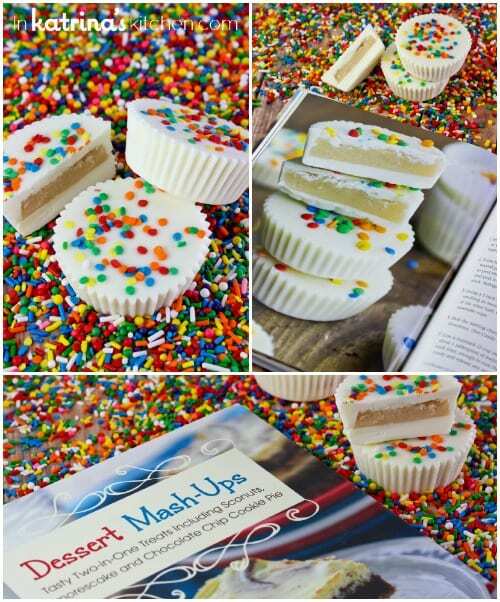 I need to make these for my kids and I need to get this book!! 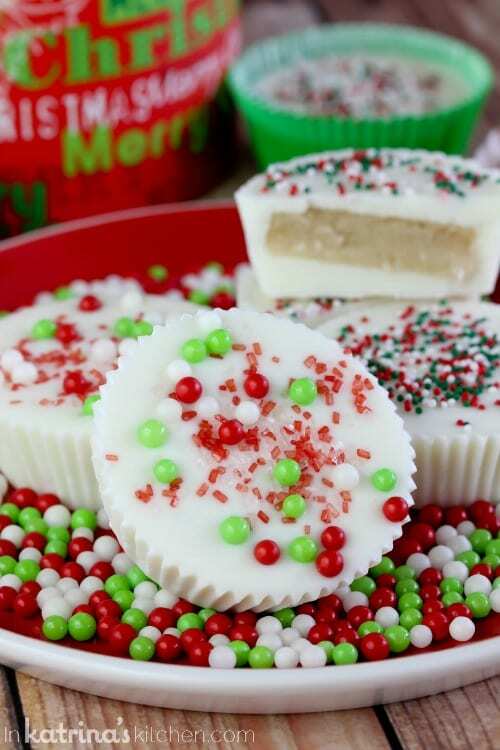 I love peanut butter cups, so I can only imagine how much more I’d love these sugar cookie ones! I also love how you dressed them up for different occasions. I saw these in the Dessert Mashups cookbook and instantly knew I would be making them! Yours came out so fabulous! Now I really can’t wait to try them! Don’t you just LOVE that cookbook? She did such a great job!! 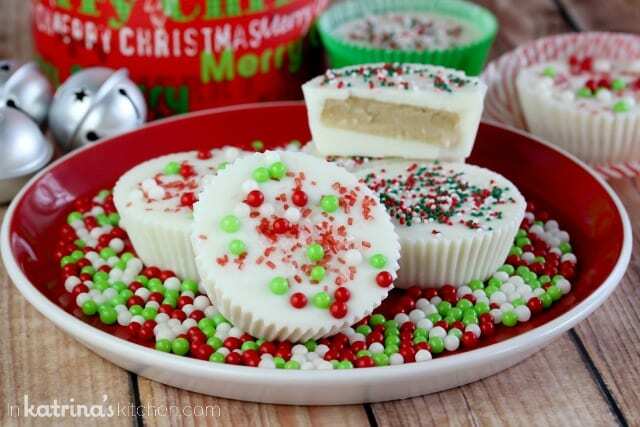 These sugar cookie dough cups look amazing! I love all of the sprinkles!